One of the most remarkable missions during the naval air war in the Pacific. 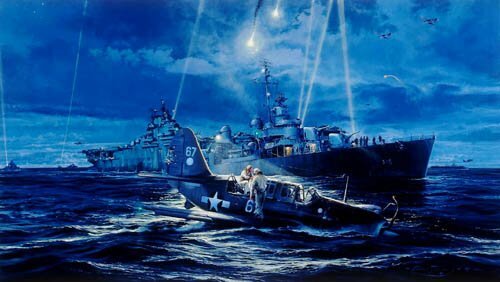 Following the attack against Admiral Ozawa’s Japanese carrier fleet on June 20, 1944, Admiral Mitscher defies all rules of naval engagement: In total darkness, with the ever-present danger of enemy submarines, he orders every ship in his Task Force 58 to switch on lights to guide over 100 returning carrier-borne aircraft, all desperately low on fuel. Amid the confusion, unable to get a landing slot aboard the USS Lexington, and now out of fuel, a pilot and his gunner scramble from their ditched SB2B Curtiss Helldiver, as a Fletcher class destroyer manoeuvres to make the pick up. Four aircrew personally involved in the ‘Mission Beyond Darkness’ have joined Robert Taylor in signing this historically important edition.